Pixi Beauty is a beauty brand that I first discovered a few years ago when I was on the hunt for a decent concealer – I picked up their Flawless Beauty Stick and was so impressed by its multi-functionality, acting as a concealer, brightening stick and foundation all in one. Although the original concealer (which still hasn’t run out!) is looking rather battered, it has certainly been well loved – I rely on it for evening out my skin tone and the nourishing ingredients work wonders at sorting out any blemishes. I’ve been trying out their new launches recently and thought I’d summarise a few of them in one post. Firstly, the Flawless Beauty Primer. I’m addicted to the youthful and fresh glow that this gives my skin and the ingredients within it also work to nourish the skin, as well as providing anti-aging benefits. I’m also loving anything that’s got antioxidants in it, as recently I’ve been concerned with the effects that city living has on my skin, and this primer does! The Undercover Crayon has become a handbag makeup bag essential – it’s in a handy stick for yet the formula of the concealer is still creamy and soft. I love the way that it provides great coverage over even the most stubborn of blemishes, without looking like I’ve caked lots of product on. I use my finger to blend it in with my foundation, and it dries matte then stays put all day! One of the cult products that all by beauty blogger pals insisted I try out is the Pixi H2O Skin Tint. I apply it on those days when I want something a little more breathable and fresh than my normal foundation, yet still getting that coverage I need. I find it needs quite a lot of blending so the Pixi Full Cover Foundation Brush is perfect for that. As with all the Pixi products, the ingredients are fabulous for the skin, and the Skin Tint contains Green Tea which provides antioxidant protection, Rose water which moisturises skin and soothing chamomile and lavender. Another of Pixi’s showstopper products is the Palette Bronzette. 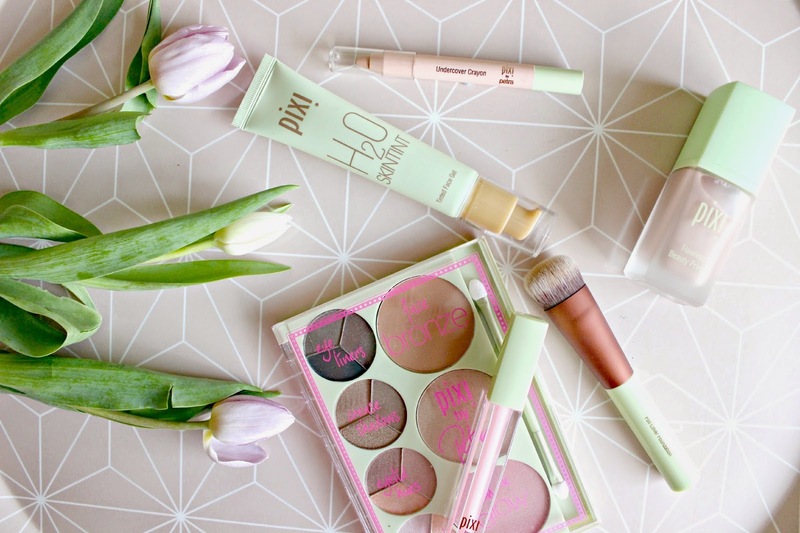 I absolutely LOVED my first Pixi palette (The Ultimate Beauty Kit – reviewed here!) so was so excited to try another. With gorgeously soft bronzer, highlighter and blush as well as eyeshadows in multiple shades, it’s all you need to add some seriously beautiful colour and contour to your face and has colours to suit every skin shade. I think this is such a versatile palette, and a fabulous one to take with you on holiday as its so slim and light but contains all you need other than your base and mascara! Finally, a lip gloss. I’m not a big gloss fan as I hate getting my hair stuck in it but this one by Pixi I just love. It is a lip plumping gloss which really works, but instead of verging on slightly painful like other plumping flosses, it has chamomile and jojoba in it which moisturise and soothe lips so it’s actually a pleasure to wear. It tastes great too (yep, I tried it.) but it makes your lips feel firm and plumped up – it’s an absolute must have for your clutch bag on a party evening, plus the ever-so-delicate pink shade is simply beautiful. So overall a fabulous haul of products from Pixi Beauty – if you haven’t already tried this brand then pop into their boutique on Carnaby Street to discover which of all their fabulous products is right for you. Previous Post Liz Earle Haircare // As Good as I Guessed!